To tell you a little about us, our office believes that a doctor’s visit should relieve stress, not produce it. We aim to continue to act like a small practice, warm, friendly, and respectful, while still excited about the practice of obstetrics and gynecology. Our goal is to provide exceptional service to our patients and their families as well as our referring physicians. Board-certified in OB/GYN, Dr. Cobb received his Doctor of Osteopathic Medicine at Kansas City University of Medicine and Biosciences in Kansas City, Missouri. He went on to complete his residency training at St. John’s Mercy Hospital in St. Louis, Missouri. 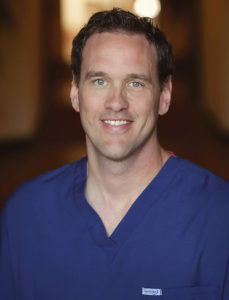 After finishing his residency in OB/GYN, Dr. Cobb went on to complete a Fellowship in Cosmetic Surgery through the American Academy of Cosmetic Surgery. Through this training, Dr. Cobb attained extensive training in body cosmetics. He is excited to have the opportunity to bring this knowledge to his practice. His approach to women’s healthcare has always been to provide exceptional care in a professional, compassionate manner. Dr. Cobb runs the gamut from medicated to non-medicated births, with an emphasis on letting his patients be heard. His biggest goal is to honor what a woman wants. Dr. Cobb says he leans toward natural births and wants to do everything he can to help in that regard. He is networked with resources in the San Diego birthing community, and is open to working with doulas, midwives and other health care facilitators to help patients with their wishes. He says the most important thing is to remember that a woman’s body is very powerful. “When it comes to birth, it’s very transformative and empowering in a woman’s life, and I want to appreciate that”. Board eligible OB/GYN earning her Doctor of Medicine from Ross University School of Medicine and completed in her residency at Providence Hospital-Michigan State University College of Human Medicine. As a female gynecologist and obstetrician in the San Diego area, Dr. Islam provides comprehensive care to women, including routine prenatal care, well-woman care, contraception management, and abnormal bleeding. She strives to provide all women with exceptional, individualized, and comprehensive medical care by patient education, attentively listening to their needs, and acting as an overall partner in their care. Dr. Islam focuses on patient comfort every step of the way in their medical management and treatment. She desires to be the support system, provide current standard of care treatment, build lasting relationships. Dr. Islam is fluent in English and Bengali. Martha brings with her years of experience in medical office management and can help you navigate your insurance questions. We hope you enjoyed learning more about us. To set up an appointment, give us a call at 858-485-0130. For questions about our services, accepted forms of insurance, our facility; our staff can be reached by phone during normal business hours. Sign up to receive special promotions, event updates and news!